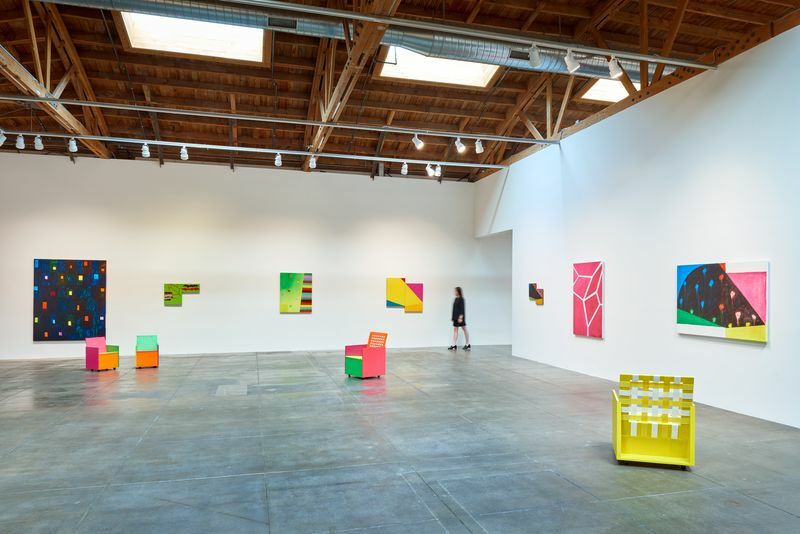 ‘Memory Remix,’ Mary Heilmann’s first Los Angeles solo exhibition in over 20 years, is a survey of paintings, ceramics, and furniture in which the artist’s unwavering dedication to abstraction merges with sly references to her favorite landscapes, songs, movies, and Mexican weavings. This preeminent American artist is acclaimed for her unique ability to deploy the analytical geometries of Minimalism with the spontaneous freehanded spirit of the Beat Generation from which her generation emerged, and for her weaving of pop culture influences into a wholly original and pioneering oeuvre. Heilmann’s deft handling of paint and spatially dichotomous compositions have exerted a profound influence upon a younger group of artists. 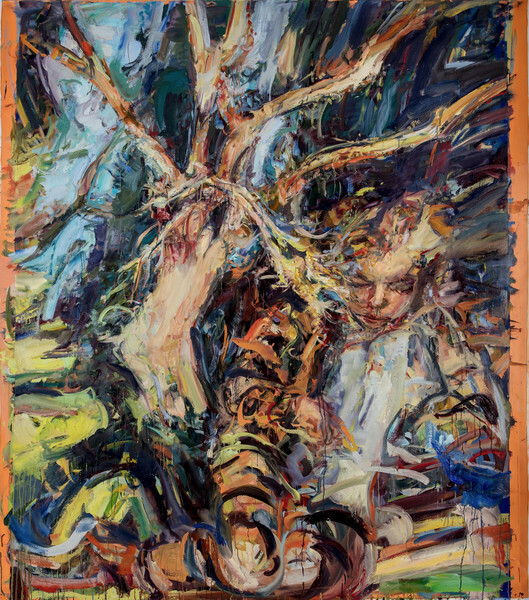 Born and raised in California, Heilmann studied at the University of California at Santa Barbara and Berkeley. In 1968, she moved to New York City to immerse herself in the contemporary art scene. 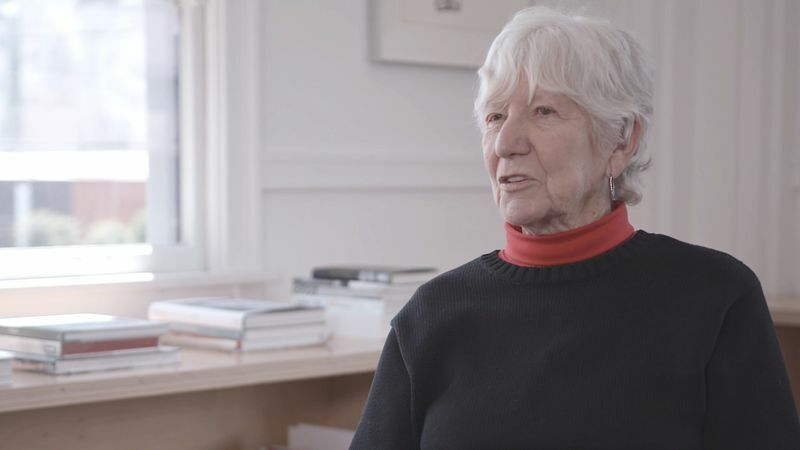 Over the course of the ensuing decades, she has emerged as a significant American master not only through her practice, but also through her teaching and lectures. Heilmann currently lives and works in New York City and Bridgehampton, New York. 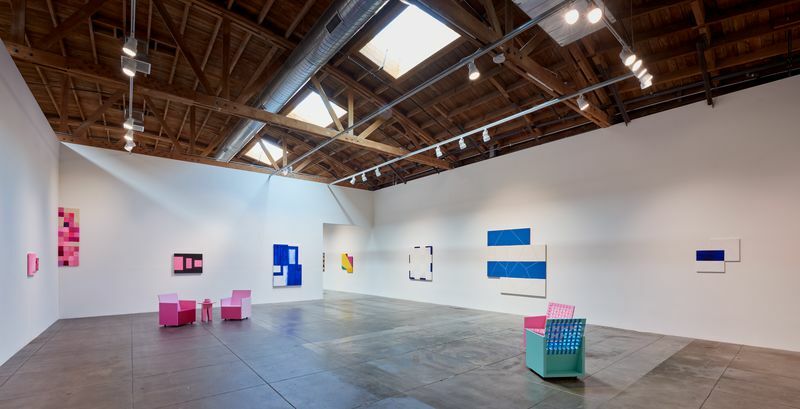 Grounded in the soul of California, Mary Heilmann’s work draws from her memories of the distinctive colors and lines of the West Coast’s landscape and surf culture. 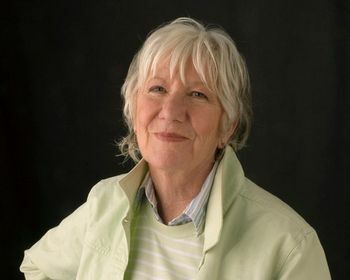 Throughout a childhood accompanied by the radio’s ubiquitous soundtrack, Heilmann often watched the ocean tumble to the shore, rode the ‘mountain waves’ at Manhattan Beach, and read Allan Ginsberg’s ‘Howl’ and Walt Whitman’s ‘Leaves of Grass,’ which stoked her great admiration for poetry, jazz, and the idea of the Beats. Under these influences and through the deceptively simple means of painting – color, surface, and form – Heilmann physically manifests nostalgic impulses, memories, and allusions to popular culture that remain accessible on both personal and universal levels. In this way, her work transcends the seemingly opaque structures of geometrical abstraction by infusing it with the content of daily life. While studying sculpture and ceramics in 1963 at the University of California Berkeley, Heilmann exclusively produced three-dimensional works. But her exposure to painter and visiting professor David Hockney would leave a deep impression upon the younger artist, shaping her artistic development in ways that only revealed themselves after her relocation to New York City in 1968. Moving to the East Coast prompted a paradigmatic shift in Heilmann’s career from sculpture to painting. 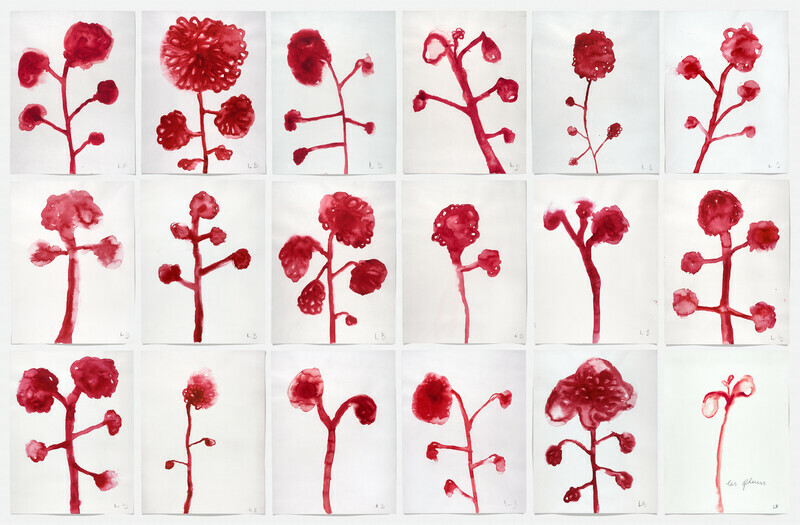 While the latter medium was proclaimed ‘dead’ by contemporary artists and critics, Heilmann undertook a conscious effort to ambush expectations, contradict art historical traditions, and provoke conversation by prioritizing a loose handling of paint and evidence of her hand and process within each work. These goals ultimately served not only to advocate for painting as a medium, but also to disrupt prevailing theories of the hard-edge and color field movements of the 1960s and ‘70s. 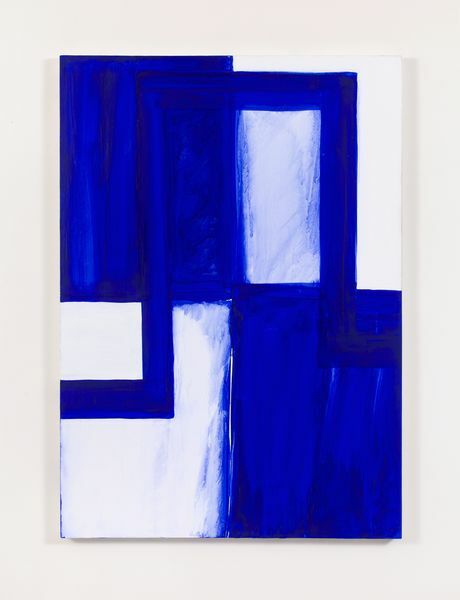 Heilmann’s early influences in California remained dormant in her life and work for many years in paintings that innovatively navigate between abstraction and allusion. 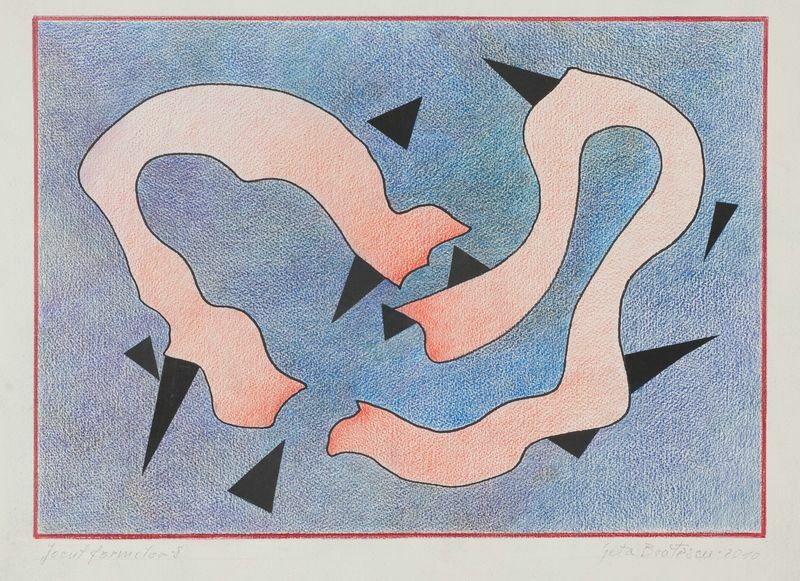 ‘Waves and Particles’ (1989), for example, illustrates her early interest in physics and speaks to her study of the ocean’s patterns and geometries through a bold palette mimicking the vibrancy of West Coast mid-century modern architecture and design. 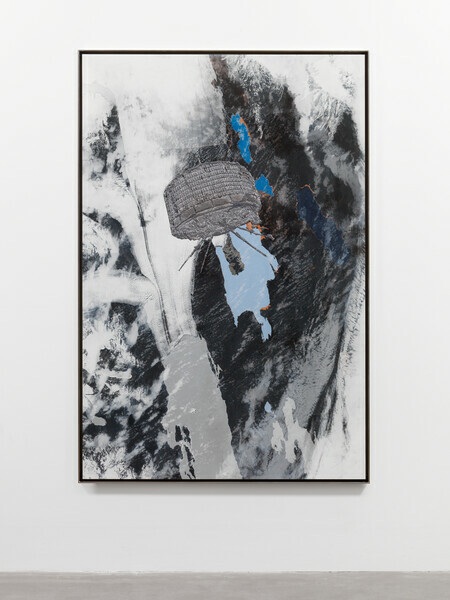 ‘Waves and Particles’ also employs a shaped canvas – a format similar to that associated with the work of her contemporaries, but unique in that Heilmann’s composition is not determined by the shape of the canvas. The boundaries of her works are thus not closed but open, and in dialogue with surrounding space. ‘Ray’ (2017), a shaped painting comprising two canvases, takes cues from its white-walled environment, illustrating the very ray of light by which it is illuminated. The stepped orientation of the two conjoined panels provides more area for the image to expand into the lower right corner, and also creates a highly dynamic composition, differing from standard rectangular works. While many of her peers were exploring a similar approach to painting at the time, Heilmann distinguished her use of the shaped canvas by abandoning the rigid structure of geometrical abstraction often paired with it, in exchange for a more content driven and spontaneous gesture. ‘Chinatown’ (1976) encapsulates Heilmann’s early investigation of color theory, inspired by Joseph Albers and her assimilation into the New York scene. 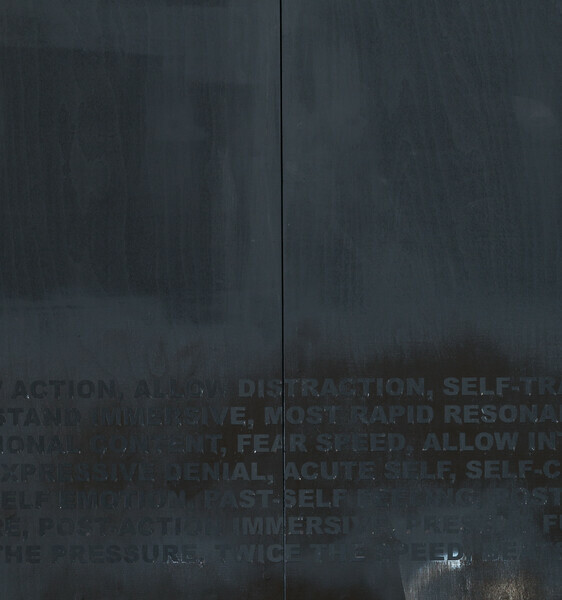 Comprising two panels, both proportional to doors or points of entry, this work serves as a metaphor for the artist’s introduction to a new city, a tribute to her East Coast artistic community, and an homage to her neighborhood. Each seemingly identical canvas has an underpainting of a different color, one blue and the other yellow, as seen on the edges of the canvases. Such modulations of hue are intensified by their placement next to one another, further illustrating Heilmann’s ability to infuse hard-edge abstraction with personal meaning and historical references. 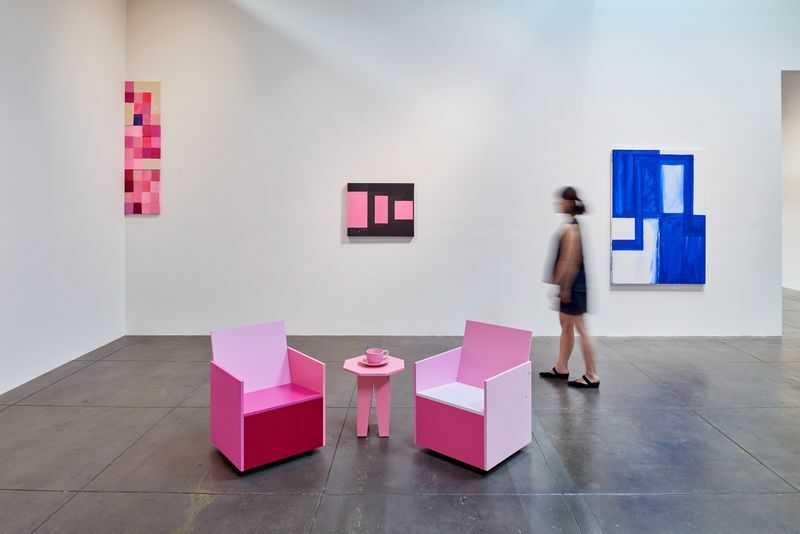 The emphasis on interaction in her work, whether personal, art historical, or aesthetic, also takes on phenomenological form by way of Heilmann’s furniture works. Performing a function within the gallery space, each is a three-dimensional painting that weaves the artists’s ideology into the everyday. 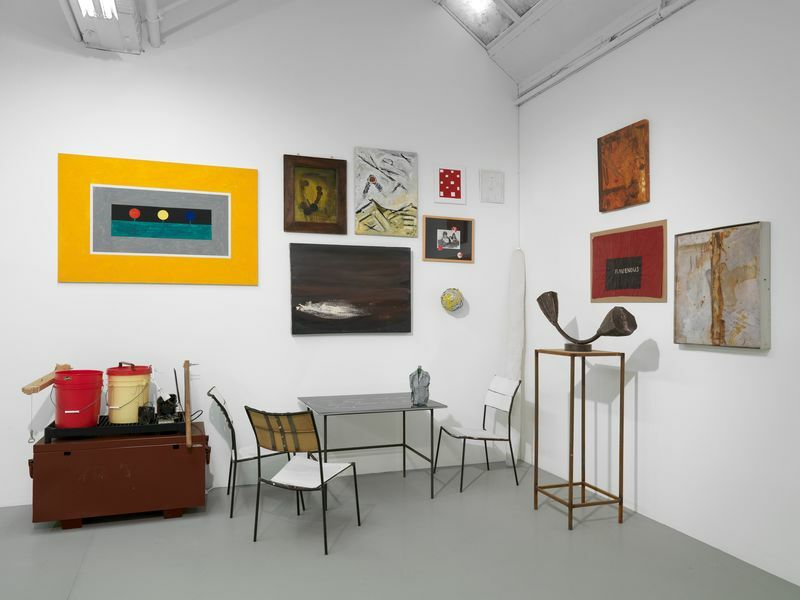 Since Heilmann’s paintings require prolonged observation for every detail and internal relationship to reveal itself, she has been known to fabricate chairs, such as ‘Clubchair 85’ (2014) and ‘Rietveld-Remix #10’ (2017), for her exhibitions, providing viewers with a still place from which to contemplate her work. While the term ‘remix’ repeatedly occurs in many of the artist’s titles — referencing the rejuvenation of an outdated tune or revival of an artistic strategy —‘Rietveld-Remix’ refers to the work of Dutch furniture designer and architect Gerrit Rietveld, who championed primary colors and streamlined designs that could be seen as forerunners of Heilmann’s.